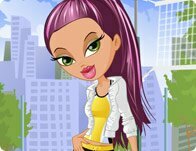 Description: Help stylize a flamboyant outfit for our gymnast friend and get a perfect 10. Don't forget to stretch first! Instructions: Use your mouse to click on and through the floating clothing, hair, accessory, and background options for this gymnastic girl. This athlete needs a stylish tennis outfit for the competition. Find an elegant and unique sport skirt for this future champion. For a splashy fun training of the acrobatic swimming team, select trendy swimwear. This little dare-devil isn't afraid of speed racing. 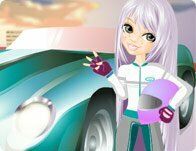 Help her style her clothes for a cool racing girl look.